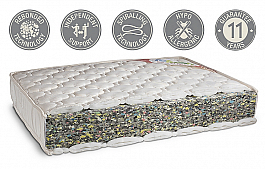 Peps Spring Koil 8" mattress best price Guaranteed 78" x 36"
Upgrade to fresh, new mornings with a world class spring mattress that is as easy on your wallet as it is on your back. The rigid, yet flexible core offers the right support for your back without losing shape even on prolonged usage. Bonnell Spring system: PEPS Springkoil uses Bonnell spring system as mattress core. In the Bonnell spring design, multiple hourglass shaped springs are connected using helical springs to form an interconnected spring unit. Edge support wire: PEPS Springkoil uses border wire across the perimetre of the mattress. This is further reinforced with M-springs all across the border wire. This type of edge support system ensures that even when sitting on the edges of the mattress, the spring unit support is supportive. Ready to Ship, no more wait !! If you are keeping very hot or cold material, must use mat or coaster. If there is any spillage, must be cleaned with the dry cloth or use little moist soft cloth if necessary. Use wax twice in a year or lacquer once in a year if you want a shiny finish. Our furniture made of natural wood so there may be a small difference and the occasional blemish. The product comes with a 12-month warranty against any manufacturing defect. Please note that a warranty does not cover any damage due to the usage of the product beyond its intended use and wear and tear in the natural course of product usage for warranty. For any manufacturing defects and damages in transit, we offer easy replacements. In case, you receive a damaged product, please contact us within 2 days of receipt. Our support team will estimate the damage and revert within 24 hours. We will either arrange to collect the product and send you a replacement free of charge or just send you a part of the product. About Product :Upgrade to fresh, new mornings with a world class spring mattress that is a..
Peps Spring Koil King Size 8" mattress best price Guaranteed * Raedy to ship. You are looking Best quality mattress for the people who have back problem.1. 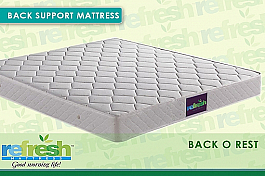 Both-s..
Refresh Mattress Best for Back problem * Ready to Ship. Peps Spring Koil Size 6" mattress best price Guaranteed 72" x 30"